My husband organised a family trip to Wooli the week before Christmas for us and both of our beautiful parents. It was heavenly, we rented a beach shack that was right on the water. Everyday we woke up early, ran down into the ocean and swan for an hour or two and then cooked up a delicious meal. Everyday was the same, SWIM + EAT + RELAX. There is an oyster farm in town so we ate fresh seafood every day, it's my kind of heaven. After a crazy year, it was the perfect way to end it, all together in pure relaxation, happiness and so much love. Me being me and always thinking work and ways I can bring to life projects I am working on, I thought Wooli would be the perfect unspoiled coastline to shoot a campaign with Australian Grapes. We have collaborated to bring you a few recipes and ways to incorporate delicious Aussie grapes into your lifestyle. 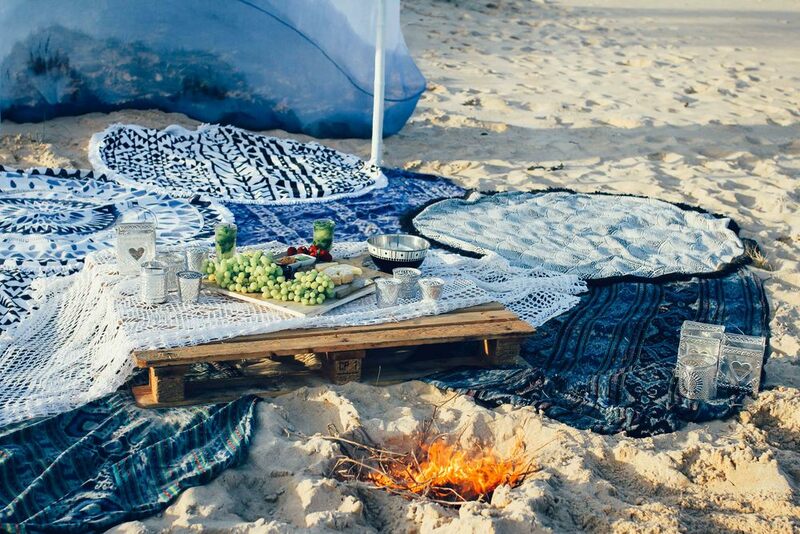 For me I love nothing more than a beach set up with Mr Bell, all our favourite cheeses, dips, crackers and fruit. Always grapes and strawberries. We built a little fire, listened to it crackle by the ocean, ate our beautiful spread and drank grape infused Mojitos. It was the most magical afternoon. I love a good Mojito and have tried my fair share, I try a bunch of variations but at the moment I am loving grape infused. Here is how I create mine... I have been using Hendrix Gin in mine instead of white rum, which is the traditional spirit. You definitely need a drink shaker to make a great Mojito, so have one handy. Chop the lime in half, then quarters and then cut into cubes from there, place all the lime into the drink shaker, tear off the mint leaves, place them in the palm of your hand and clap your hands together a few times, apparently this releases all the delicious mint flavours. Next up add your sweetener, I purchase my sugar syrup from Dan Murphy's, they have it in their cocktail section or you can buy it online here, I try not to have too much nasty sugar so have been adding coconut sugar sometimes instead of the syrup, either works well. Next up add your grapes, make sure you slice them in half before you add them to the shaker. Once all of your tasty ingredients are added, pour 1.5 shots of Hendrix Gin or you can use traditional white rum or even vodka. You then start "muddling" all of the ingredients, muddling is just a fancy word for crushing. You can buy muddling sticks but they look the same as a rolling pin, so just use whatever you have handy. Continue to muddle all of the ingredients together until the juices from the limes and grapes have combined with the alcohol. Once blended, add a handful of ice, put the lid on top of the shaker and do your best bartended impersonation and shake that drink like crazy. Pour the mixture into your glass and fill the remaining space in the glass with the ginger beer, give it a stir and voila! You can add anything you love to the mix, I often add passionfruit or fresh raspberries. Click on any of the below for the gallery to open + stay tuned for part two of the Australian Grapes campaign. Get on-board with Australian Table Grapes this summer to raise awareness about heart health and help support HeartKids Australia. Six babies are born with a heart defect everyday in Australia. Australian Grapes are proudly supporting HeartKids Australia, a charity dedicated to providing support to those with childhood heart disease and their families by providing social and financial support. Raise your grapes and get involved by taking a #CAESARSELFIE to promote heart health and help raise funds for HeartKids Australia. SNAP a selfie with a bunch of Aussie Grapes, TAG #CAESARSELFIE #GRAPESFORHEARTS #HEARTKIDS and SHARE on your Facebook or Instagram. SUMMON 3 of your friends to snap their own #CAESARSELFIE by tagging them in your photo. There are plenty of ways you can get involved to help raise money for HeartKids Australia. Start your own team on our Everyday Hero page and host a toga party with your friends, family, work colleagues or sporting club. Host a grape and cheese night. Start the day with grapes and host a breakfast at your work. Put on a Toga BBQ.